Please Note: There are small differences between the construction notes and in the drawings presented here. The construction notes are correct and the drawings should be viewed as a rough layout of the device. Cone and ring bands)1.25� wide x 1/16� thicksteel Tie Down Engineering banding cut in half for cone rim and rings. Cone Pivot Points) 1/8� steel rod. extend from tip to center. 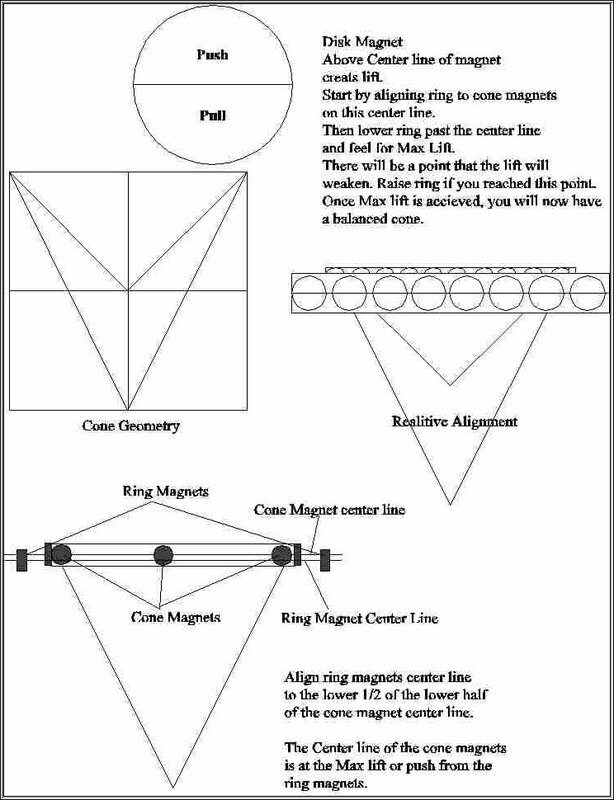 Top activating magnet) same as top cone mag. Cone center magnets)1 1/8� ceramic #5 doughnut mags with 3/8� center hole. Shell) large coffee cans with top and bottom cut off. Built cone frames from 1/2� square dowel with brace that goes across at the center of the cones.Glued with TiteBond Wood Glue.Cone frame is 53 degrees.Drilled hole in the center of the center brace of the frame for placement of the 1/8� steel rod. Cut steel rod 2 1/8� long. Place into the hole in the frame half way and glue with 2 part fast drying epoxy.Screw a 1/8� x 1/4� flat headed Phillips head Zinc machine bolt into other side of the hole.This is to allow adjustment of the height of the cone above. 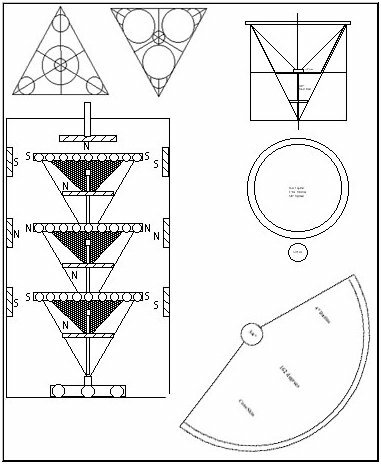 Cut Cone rim from 3/8� plywood 4� diameter 3/8� wide.Cut 3/4� diameter 3/8� plywood 53 degree angle piece for the tip of the cones.Drilled 1/8� hole in the center of this piece for the 1/8� steel rod.This also gives support to the cone tip. The cone frame now looks like a �Y�.Glue the Frame to the cone rim with wood glue at the exact center line, and screwdown with #6x3/8� automotive trim screws. Cut the steel banding material in half to approx. 1/2� about 12.6� long.Bend by hand to form a circle 4� in diameter.Glue and Clamp to the cone rim.Let It Dry! 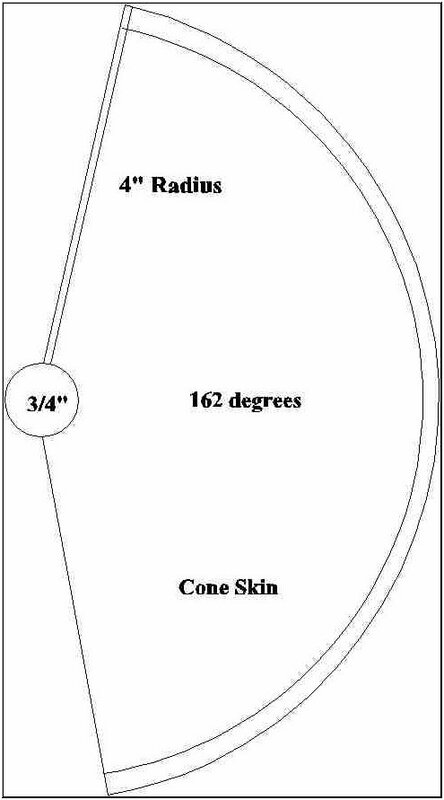 After it is 100% dry, time to attach the cone skin.Mark a semicircle with a 4� radius and 162 degrees.Cone only need 161 degrees; the excess is for overlap. Cut out of .01� aluminum flashing and cut a 3/4�radius circle out of the center of the larger 4� rad. circle. Glue the 3/4� diameter cone tip brace onto the 1/8� center steel rod.Must attach the skin before the glue dries.Wrap the aluminum skin on the cone frame and attach with small picture hanging nails.Glue the inside of the skin to the frame with Goop.Place Goop around the outer skin at the cone rim to glue it to the rim.After the Goop has dried, remove the nails in the skin. Glue 12) 1� disk magnets to the steel band on the cone rim evenly spaced.Magnets must be clamped to prevent movement of the magnets.All magnets have the same side facing out. Glue a 1 1/8� doughnut magnet to the center of the cone frame with the pivot screw in the center with Goop.All Cone center Magnets North Poles up!Will explain Magnetic layout later.Create 2 more cones the same way, except the top cone.The Top cone rim should be solid 4� diameter.Glue, with goop, a 1.75� ceramic magnet in the center of the top of the top cone with North facing UP! After all cones are assembled, file the tips to a very sharp point of 30degrees exactly at the cross section of the cone angle. Cone height will be 4� from point to rim. Cut steel banding in half and 16.5� long. Hand bend into a circle 5.25� diameter.Overlap and drill 1/8� hole in overlap.Place #6 machine screw in hole and cut off inside excess.Now, glue 15) 1� disk magnets to banding with Goop.Repeat 2 more times.The 3 rings are complete. Cut two equal lateral 3� triangles out of 1/8� wood paneling. Drill a 1/8� hole in the centers. Get some plastic pill bottles with the bottom center curved like the bottom of a soda can, and cut this part out with a hot knife.Drill 3/8�.Glue the plastic cups into these recesses with Goop.Set on flat surface with the cup on the surface, and press firmly down to align the cups. Bottom of Base: Glue a 1/8� piece of steel rod in the center hole of the base piece.This needs to extend through the base into the fame base where there is also a 1/8� hole drilled.This makes sure the base is in the center.Glue the base to the frame with wood glue. Now glue with Goop a 1.75� doughnut magnet to the center of the base with the North pole up! Top of Base: Take a 5/16� tall 3/8� diameter aluminum barrel with a 1/8� center hole.Cut a 1/2� long piece of 1/8� steel rod and glue in the center of the top base with epoxy. Glue the Aluminum barrel to the steel rod so that the rod extends half way into the barrel.The barrel should be tight to the top of the top base and the rest of the steel rod extends through the top base.Glue three 1� disk magnets to the top of the top base piece positioned so they fit within the sides of the corners and do not go over the edge. They should be around the center barrel, cups down.North poles up.Place three 5/8� glass marbles in the bottom base cups, and place the top base over them.Poles are in attraction. Base pivot is drilled with a 1/16� drill bit, then lightly drilled with a 1/8� bit.Drill the 1/8� steel rod only. Take a large coffee canand remove the top and bottom so you have a cylinder.Take another coffee can and cut off a 3� high piece with the top removed.Glue and tape together with epoxy and electrical tape.Shell should now be 9.5� tall and 6� diameter.Inside ridges need to be flattened at 120 degrees apart to allow the frame to slide in snug.1/8� holes will be drilled later in the shell at the tops of each outer cone ring spaced 1� apart. You will only have 2 rows of holes as the top and bottom are already vented. More later on assembly. Place bottom cone in the aluminum barrel in the base.Take the bottom outer cone ring and slide down inside the Device frame.Align the ring so it balances the cone in the magnetic field.Once it is balanced, mark the bottom of the ring with a marker on the wood frame.Now slide the ring down till the marked line is about in the center, but not quite.Have another person hold the cone to keep it from lifting out.Adjust the ring for max lift(you can feel the force).Mark the top an bottom of the ring on the frame with a marker.Remove the cone, and glue the ring with Goop to the device frame aligned with the top and bottom marks.Let dry 100%!! Each cone is different due to the differences in the magnet alignment.Now place the bottom cone in the base barrel, have someone hold it down!Place the middle cone in the center screw of the bottom cone.Slide the middle ring down and do the same alignment procedures as above.Remove the cones, and Glue the ring.Do the same for the top cone and ring.When you place all three cones in the device, you will notice a very, very strong lifting of the cones. Wrap the rings with #26 copper magnet wire.Two windings between each ring magnet.Start at one of the side pieces of the device frame at the top.After winding the top ring, move down to the middle ring and wrap in the reverse order of the top.Top, middle and bottom windings are all one piece of wire connected.Wind the bottom ring in the reverse order of the middle. Take one of the ends of the coffee cans that was removed and cut a 2.5� hole in the middle.Place this end upside down at the bottom of the device.The middle is now higher than the edges.Slide the shell over the device frame and position so the bottom plate with the hole is aligned with the shell.Tapeseam with electrical tape. Mark the shell at the area 1/2� above each outer cone ring. Lift the device frame out of the shell.Drill 1/8� holes at the lines marked on the shell 1� apart.Two rows total.Take one of the other ends of the coffee cans and drill a 1/4� hole in the center. Turn upside down, so the center is higher.Glue with Goop a 1/4�zinc machine nut to the top at the hole.Screw a 1/4� x 3� bolt into the nut on the plate only so the bolt extends through the plate enough to allow you to place another 1/4�nut on the end.Place a 1.75� doughnut magnet on the bottom of the plate in the center.Make sure to put wax paper under it.Fill center of the magnet with epoxy, so it totally covers the nut on the end of the bolt.Let dry.Attach 1 more 1.75� magnet to the lid magnet. North Pole should be down! Place cones into the device and place the lid on.Have someone hold the cones while you work.Screw the bolt with the magnets on down until you are able to create enough force to hold the cones down.Pickup the device, holding the lid down secure, and place in to the shell.There will be about 1/4� air gap around the top. Move the lid and adjust the magnet height until the top cone is centered!Screw the lid down to the device frame posts with #6 machine screws.The top copper wire should be connected to the outer shell and the bottom copper wire should wrap around the 1/8� steel rod that extends from the top of the top base piece to the middle of the base.This is the pivot point, and the wire is connected in-between the 2 base pieces to the pivot. If all is aligned right, you will feel a cool breeze going into the bottom of the device.The outer shell will start to get warm near the outer cone rings, just beneath the air holes.You will feel air coming from these holes as well as the air gap at the top.There is also a very peculiar odor that comes out the top and holes of the device.After about 5 mins or so the cones will appear to stop moving.If you look in the top air gap at the reflection on the top cone magnet, you should see a shimmering of light.This looks like the shimmering of light on a smooth pond.You can also feel a slight vibration on the shell as well as the surface you place the device on.As the device sits, the breeze and the smell gets stronger. 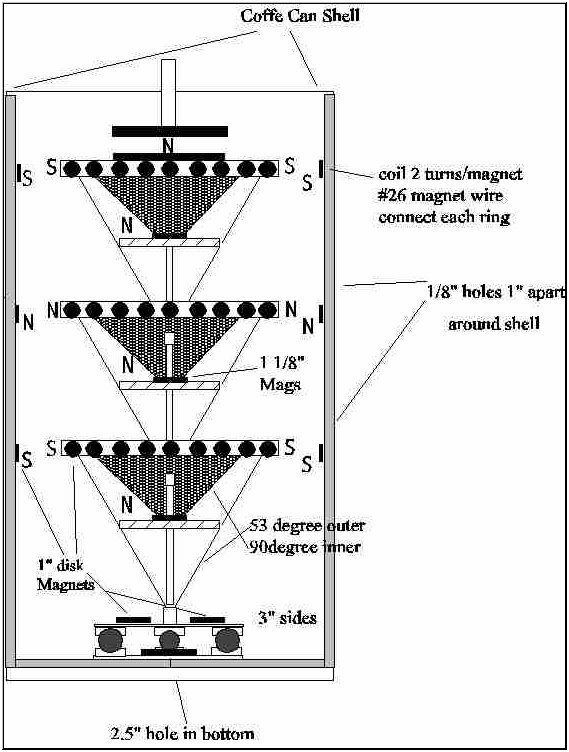 All magnets create a magnetic flow from the bottom up in attraction till it reaches the top magnets then the flow is repelled down.All magnetic fields are contained within the shell.Air is forced out of the holes. After setting for about 20 min, the device was glowing a yellowish orange color, the TV in the other room had distorted line all through it, and then boom!The color was brighter at the openings before implosion.The room was showered intiny pieces of metal and magnets.Some went through the ceiling.Big mess, and a lot of work gone.Next time I will stay with the device while it is active. 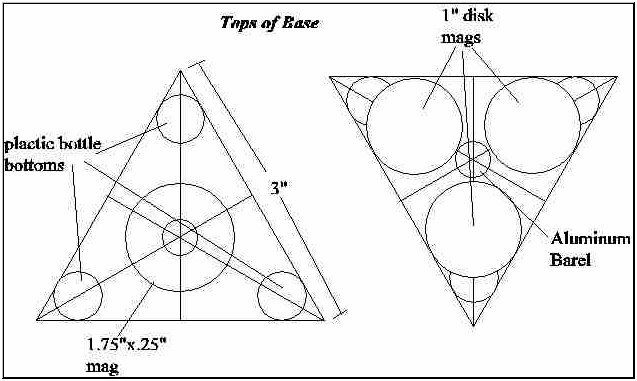 If you further interested in the hamel flying disk project check out their Full website for photos and diagrams and tech information on building one.